Frugality is in style these days, especially in the English-speaking world. 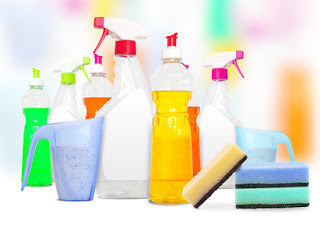 With a simple Google search, you can find oodles of recipes on a variety of for food staples, cleaning or other household supplies you'd normally buy - soap, washing powder, scented sprays...you name it. I've tried my hand at more than a few of these, and while the experience has undoubtedly enriched my life (not to mention my knowledge base), I've come away somewhat skeptical of the frugality of some of these solutions, both moneywise and in "real life price". Many blogs dealing with frugal habits have other, stated or unstated, agendas as well - simple living, anti-chemicals or supposed toxins in commercial products (I confess I fail to understand how sodium bicarbonate, citric acid or acetic acid are somehow not chemicals, even if you call them baking soda, lemon juice or vinegar), or specific diets (vegetarian, vegan, paleo). Which is entirely fine, if following a specific diet or avoiding certain chemicals is your primary goal. Such recipes might well even be cheaper than similar commercial "ecological" products sold in health-food stores and online. I'm just not sure they always measure up in terms of strict dollars-and-cents (or Shekels-and-Agorot) frugalty. This is especially true when you compare the Israeli reality to that of, say, the US. Supplies such as milk powder, Borax or rubbing (isopropyl) alcohol are not readily available in stores here. Baking soda is also not always easy to purchase in bulk, which raises the price.You can order these items online (here's Borax, and here's isopropyl alcohol, for example), but then you have to factor in shipping or transportation costs - as opposed to a simple trip to your local drugstore which you'd be doing anyway for other items. Don't get me wrong - if you enjoy the DIY aspect of making your own household staples, or are allergic to specific commercial products, that alone makes it worthwhile for you to make your own. I'm not sure that is universally true, however. 2 bars of the soap of your choice, grated (American recipes usually call for either Fels Naphtha or Castille soap, but for purposes of frugality, I think we'll stick with 1 bar of Syntabon, which is available just about everywhere here and is about twice as heavy as regular bar soap. The link shows the price for a double bar). This will make you about 1kg of laundry powder, as a cup of both Borax and baking soda weigh about 200gr. The cost? If we buy our supplies at the places designated by the links (which were the cheapest I could find) and without factoring in shipping or transportation costs, I get NIS 18.95 (25*0.4+15*0.4+5.90/2). Except that I usually get a 6kg bag of Tide on sale for about NIS 50, or an 8kg bag for NIS 60 - which comes out to NIS 8.33 and NIS 7.50 per kilo, respectively. See what I mean? Our "simple, cheap" recipe costs more than twice as much as the commercial version. And remember, we haven't even figured in the shipping costs of the ingredients. Yikes! Let's compare this with what I consider a "worthwhile" recipe: the scented sugar scrub recipe I mentioned in my post about Vitacost. Given that similar sugar scrubs cost around NIS60-90, let's see how much money making it on our own saves us. 10-15 drops of essential oil - which you already have from your previous project. So less than NIS 2 for something that costs NIS 5-20, store-bought. So, boys and girls, our take home message for today is: Don't assume it's frugal just because it's on a frugality website. Adapt the recipe to the Israeli reality, do the math, and then decide.